With Elections on the horizon, the Town Council invites prospective councillors along for an insight in to Council life! 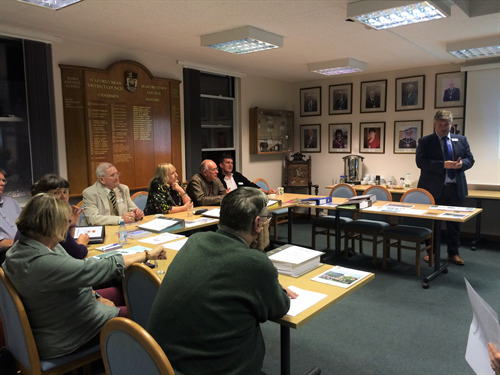 Seaford Town Council held an open evening on 20th September for prospective councillors in the coming by-elections, which are scheduled for 27th October. The Town Council currently has five casual vacancies and was keen to give individuals considering standing for election the chance to come and meet with current councillors and staff and learn about the Council and the role and responsibilities of being a councillor. The evening was well attended, with over 20 people coming along to express their interest in the five positions and take the opportunity to better their understanding of the Town Council direct with those in the know. The Town Clerk gave a presentation to those in attendance (a copy of the slides are available on the Council’s website), which was followed by an encouraging level of questioning and discussions between current councillors and those looking to find out more. [Text Box: Current Councillors and the Town Clerk answering questions put forward by potential councillor candidates.] Individuals wishing to stand for election must have submitted their nomination papers to Lewes District Council by 30th September at 4pm at the latest. An announcement of the nominated persons will then be made on 3rd October. Lewes District Council are responsible for administering the elections and can be contacted on 01273 471 600 with any queries. The Town Council will share any updates on its website, Facebook and Twitter sites as and when they become available. Anyone wanting to know more about the Town Council or the role of councillor is advised either to visit the Council’s website, at www.seafordtowncouncil.gov.uk , where there is a wealth of information or contact one of the current Town Councillors directly. The five vacancies are as follows: Seaford Central ward 2, Seaford North ward 1, Seaford West ward 1 and Seaford South ward 1. Photo: Councillors and the Town Clerk answering questions from prospective councillors at the Council's open evening on 20th September.